Venezia Grande Estates Vineyards Homes: Among the Estate Homes of Venezia Grande Estates – (Vineyards most exclusive neighborhood) sits 636 Venezia Grande Drive. This meticulously thought out CUSTOM 4 bedrooms + Den Residence offers Custom Gourmet Kitchen, both Living and Family rooms with a Huge Master Bedroom and Luxurious Master Bath. The Extra Large Outdoor Entertaining Area has a Custom Infinity Edge Pool, Plenty of Covered Lanai Area including a Custom Outdoor Kitchen/Bar with Barbeque, Ice Maker, Dishwasher and Brazillian Grill. The extra large 4 car air conditioned garage comes with added custom features for the most particular of auto enthusiasts. A gas fireplace, underground LP propane gas tank, Lutron lighting system, central vac, security system and 3-zone a/c complete this unique and luxurious home. The unparalleled quality, detail and finishes will please the most demanding homebuyer. Venezia Grande Estates Vineyards Homes: Welcome to Vineyards Venezia Grande Estates, where a distinctive, majestic gated-entry leads you to a prestigious enclave of 24 custom estate homes on this private brick paved cul-de-sac. Built in 2015, this timeless architectural masterpiece offers over 4,200 sq ft. of furnished, air-conditioned living space with every luxury desire met including hand-carved stone entry and 180 degrees of premium golf views on a sprawling .45 acre lot. Four bedrooms plus den, four and a half baths and three car garage, this neo-classic estate features imported marble flooring and custom cabinetry throughout, gourmet kitchen with gas stove, elegant gas fireplace, plantation shutters and two wet bars. An expansive lanai highlights the extravagant pool and spa with covered area including an outdoor kitchen for the ultimate entertaining. Impact glass throughout and a new pool cage with picture-window framing to ensure endless golf course views and blue skies above. Vineyards Country Club offers an optional private membership complete with 36 holes of Championship Golf, 12 Har-Tru tennis courts, award winning Fitness Center and a resort style pool and spa. Terracina Vineyards Homes: This Terracina home promotes tropical and golf course living. Expansive views overlooking the 2nd hole, this elegant residence features marble columns ahead of double entry mahogany doors leading to marble floors, volume ceilings and light, bright rooms throughout the home. A split floor plan offers privacy and functionality. the Master Suite has hardwood floors, dual Master bathrooms, a cozy gas fireplace, French doors to the lanai and crown molding The study has tiger wood flooring and a custom built-in desk. The Living Room entices gatherings with a gas fireplace and is adjacent to the generous-size Dining Room. Your open kitchen built for a chef offers a gas cook-top, granite counters, a bar area with wine fridge, and eat-in dining area. The family room is ready for entertaining and connects the “indoors to the outdoors” with the disappearing sliding glass doors which open to seamlessly add the expansive lanai to your living area. Relax by your heated pool and spa and enjoy the rolling hills of the golf course and the one-of-a-kind sunsets with the SW exposure. A truly elegant home providing privacy, beauty and sophistication in the terrific location of the Vineyards. Hammock Isles Vineyards Homes: Former Cambridge model, ideally placed to accentuate one of the most spectacular views in the Vineyards! Exceptional floor plan includes one-level living and multiple entertaining areas complete with walls of glass that pocket back and open onto covered loggia. New custom kitchen, with top-tier Monogram appliances, Quartz countertops, and subway tile backsplash. Separate master suite with dual walk-in closets, large marble shower, and Jacuzzi jetted tub. Extensive upgrades including Control 4 centralized lighting and entertaining system, newly installed dry bar with Sub-Zero wine refrigerator and plantation shutters throughout. Outdoor kitchen complete with Lynx grill overlooks expansive salt water pool, complete with sun shelf and spill over spa. The Vineyards is a private country club offering two 18-hole courses, active tennis program and various other activities including a 15,000-square-foot wellness center and spa. Hammock Isles Vineyards Homes: DARE TO COMPARE IN HAMMOCK ISLES- OVER $250,000 IN IMPROVEMENTS. Having ample room for entertaining; this remodeled one level four-bedroom plus den home awaits the most discerning buyer. From the moment you enter through the hand forged wrought iron custom door; you will experience and see beautiful and modern décor. Stainless steel appliances, marble floors, stunning light fixtures, large closets, plenty of storage, brand new roof and so much more. It truly is a fabulous place to live! Vineyards is a private country club that has two award winning 18 hole championship courses for all skills levels. There is a brand new 15,000 sq. ft wellness center and spa that will focus on your well being. From tennis to pickle ball to hundreds of activities annually, memberships are available. Relax in peaceful tranquility by water features, a lake, white flowing curtains and a redesigned private pool and spa. Enjoy the company of family and friends by your custom bar/grill and travertine paved and screened in lanai . Live the Vineyards lifestyle IN STYLE! The brand new and beautiful roof has been installed - come see! Terracina Vineyards Homes: FULL GOLF MEMBERSHIP INCLUDED WITH PURCHASE!!! Fresh New Look! Custom Built Estate Home in the Prestigious Terracina Neighborhood in Vineyards. Four Bedrooms plus a Den, Four and a Half Baths and Three Car Garage. Expanded Windsor Model with over 4300 Square Feet Under Air. Huge Bonus Room on the Second Floor with a full bath. Southwestern Exposure with Panoramic Golf Course and Lake Views! Heated Pool and Spa. Private Entertaining on the Expansive Pavered Lanai. Electric Hurricane Shutters. Extra Storage Complete with Air Conditioned Storage Room. Many Upgrades! Gas Fireplace, Crown Moldings, Tray Ceilings, Custom Cabinetry, Granite Countertops in Kitchen, Tumbled Marble Backsplash, Stainless Steele Appliances, Gas Cooktop. Automatic LED Landscape Lighting. Large Pavered Circular Drive. Vineyards Country Club offers four levels of optional Private Membership complete with 36 holes of Championship Golf, 12 Har-Tru Tennis Courts, Pickleball & Bocce. Brand New Wellness & Spa Facility with Fitness Center, Café, Halotherapy Salt Room, Massage and Salon Services, Salt Water Lap Pool. Hammock Isles Vineyards Homes: Classic and open, this wonderful home is positioned to capture beautiful morning light as well as the filtered afternoon light. Entering through stunning iron and glass doors, the living and dining spaces are open with marble flooring, ceiling details, and a wall of glass to showcase the outside living space. The renovated kitchen boasts gas cooking, two ovens, beautiful countertops, subway tile, pantry and center island and opens to the family room with pocketing sliders to the screened lanai. The design provides for a private master suite with the study/office nearby and two en-suite guest rooms. The lanai provides space for lounging by the heated pool as well as covered areas to relax in the shade. Additionally, the home has a three car garage, plantation shutters and central vacuum. The Vineyards offers optional memberships to the Vineyards Country Club featuring a Racquet Club with Tennis and Pickleball, Wellness Center, and two Championship Courses. Hammock Isles Vineyards Homes: H.13573 - Sensational wide and long lake and fountain views in a luxurious one story 4+Den, 3 1/2 Bath home with massive 3 car garage. Newer section of Hammock Isles in low fee gated community of Vineyards. Home includes high impact glass, electric storm shutters, no carpeting, gorgeous curb appeal, terrific outdoor living space with massive covered lanai patio overlooking breathtaking views beyond pool and spa. Camelot Park Vineyards Homes: This exquisite custom built residence has been transformed by it's original owners into an amazing chateau on CAMELOT Park! In the Vineyards. Only 35 private residences in this enclave & backing up to an incredible park! The custom front doors built in South America, an oversized lanai, tall ceilings, custom wood "speakeasy" doors & an unbelievable master suite combine for a one of a kind masterpiece. The owners suite boasts copper hammered sinks, a hidden tv behind a vanity mirror, reclaimed Jerusalem stone, a barreled walnut ceiling, granite sitting bench with multiple shower heads and a copper soaking tub. The kitchen is the "piece de resistance" featuring a new double drawer Fischer Paktel dishwasher, warming drawer, copper hammered farmers sink, pot filler, a six zoned cook top, wine cooler and walk in pantry. The large FLEX ROOM was the media room for the current owners & could easily be a fifth bedroom, billiards room, exercise room. Numerous memberships optional in the Vineyards Country Club and new wellness center an incredible location. Freshly painted foyer, dining room and living room in neutral tones. Hammock Isles Vineyards Homes: H.13716 Set within the exclusive Hammock Isles at The Vineyards, this premium home is a masterclass in luxury. From the sprawling 3598 sqft floorplan to the bespoke features & grand architecture, this is a home perfectly crafted for those who prefer the finer things in life. Whether you like to entertain, relax in the sunshine or indulge in quiet escape, there is a space for you. Soaring ceilings, an open-concept floorplan and a seamless flow from the inside to the outdoor living spaces create a light-filled and welcoming home.Coffered ceilings, designer chandeliers and travertine flooring enhance the luxurious feel of this expansive home, while the gourmet kitchen with granite counters, custom cherry cabinetry & a suite of upgraded appliances adds functionality.There are four bedrooms including the stunning master suite. Separate from the other bedrooms, the oversized master boasts custom closets, plus its own hot water system that serves the exquisite ensuite with walk-in shower and jetted tub. The outdoor living spaces are just as impressive with a heated pool and spa, plus a lounge area and lanai with summer kitchen, rotisserie grill & bar surrounded by lush tropical gardens. Terracina Vineyards Homes: If you viewed this before-come see it again...NOW it is BETTER THAN NEW-RENOVATED-IN PRESTIGIOUS TERRACINA COMMUNITY OF THE VINEYARDS GOLF CLUB. (Terracina: lushly landscaped small community of upscale homes within Vineyards). This spacious open floor, 4 BED+DEN/3+1/2 bath single family home has been extensively renovated with new stainless appliances, rich wood flooring throughout, new carpet in 3 of the beds, new tile in baths, freshly painted interior/exterior, new garage door & landscaping, custom baseboards & coffer tongue/groove ceilings, LED lighting, remodeled master bath with new tile, counters, soaker tub, glass shower, and the list goes on... VIEWS, VIEWS, VIEWS...From the moment you enter the grand foyer, or relaxing by the floor to ceiling tiled fireplace, cooking in the spacious kitchen, looking out the master bedroom, or in the Great Room, this open, light/bright home has expansive WESTERN sunset/golf course views from most rooms of the home! Also, enjoy the Florida sunsets/golf course vistas from the spacious screened lanai complete with pool/spa. A+ SCHOOLS, SEVERAL MEMBERSHIPS TO JOIN...OR NOT, & A SHORT DRIVE TO THE GULF MAKE THIS THE PERFECT PLACE TO CALL HOME. Terracina Vineyards Homes: FREE LIFESTYLE MEMBERSHIP TO THE BUYER. Better Than New! Best value in Terracina . Completely Renovated With NEW ROOF. In upscale neighborhood. 4 BR + Den /4 BA. Built in outdoor kitchen and bar for a relaxing poolside dining experience. The house features a formal dining room, an office, and a formal living room with a gas fireplace. Marble floors in the living area. Plantation shutters, intercom, and 2-zone A/C. Vineyard Community offers great amenities. Located in the heart of Naples, close to the beach, shopping, restaurants and the I-75. Community zoned for grade A schools. If you want to live the luxurious life of Southwest Florida, do not miss the opportunity to own this dream home. Call today and make an appointment! Hammock Isles Vineyards Homes: H.14432 The stunning home you’ve been looking for is now on the market. Hammock Isles is a Premier Vineyards quality neighborhood in the heart of North Naples. This home is a masterpiece of contemporary interior design with a multitude of special custom features. Imagine sharing an evening with friends and family on your spacious lanai with lap pool and spa overlooking a lake and sparkling fountain. Your dinner is roasting on the grill in the outdoor kitchen and a custom wine rack is just steps away in the game room. Other custom features include a TV wall unit, Roman shades and the large expanse of sliders to the lanai are framed by unique wood panels. The well appointed kitchen opens to the living room that adds to the casual open style floorplan. Camelot Park Vineyards Homes: H.13744 - Soaring ceilings, crown molding, tray ceilings, gorgeous Majestic wood floors, curved doorways, & miles of glass, all on the 15th green! BRAND NEW pool screen cage,FRESHLY PAINTED kitchen,family rm. living & dining rms: ALL NEUTRAL and ready to move in! Modern cook’s kitchen: cherry cabinetry, island, breakfast bar & stainless top of the line appliances. Even a Wolf 4 burner gas cooktop! Love to entertain? An exceptional floorplan where dining, living, & breakfast rooms, plus oversized family room, flow easily from one to the other. Home office too: custom built-ins, French doors, walk-in closet, huge window & custom shutters. Dream master suite: wood floors, sitting area, double doors out to the lanai & 2 walk-in custom closets. Serene spa-like bath w/ 2 elevated vanities, makeup area, spa tub, large walk-in shower with pebble floor & 96” of clear glass surround. The guest rooms? Set away from the master bedroom for privacy & comfort incl. an in-law suite, or media room, with pool & patio access! Sparkling blue pool & tiered spa surrounded tropical foliage for maximum seclusion + travertine stone, & summer kitchen with built-in gas grill. Over 15 closets & 3 car garage! Hammock Isles Vineyards Homes: FREE VINEYARDS COUNTRY CLUB GOLF MEMBERSHIP INCLUDED. Arbor Glen Vineyards Homes: Welcome to this stunning Arbor Glen home featuring his and her master bathrooms and chef's kitchen! Located in the highly desirable Vineyards with beautiful clubhouse, two award-winning 18 hole golf courses, wellness center and spa. This meticulously maintained home features Sub-Zero appliances, gas cooking with commercial grade hood in the beautiful chef's kitchen. The spacious den offers beautiful finishes and built-in shelving. Updates include two HVAC systems replaced in 2017, newer marble in master bath, newer gas grill parts and outdoor refrigerator. Custom lighting throughout the home accents the beautiful volume ceilings. The spacious three-car garage completes this luxury home. The Vineyards is conveniently located near world-class beaches, shopping and A rated schools. Valley Oak Vineyards Homes: With panoramic views of the South Golf Course and lake, the expansive lanai gives you ultimate privacy and tranquility. This grand 4 bedroom, 3 full bathroom home is thoughtfully laid out to to entertain guests, while still allowing for privacy. Newer cabinets and granite counters are in the kitchen and bathrooms as well as frameless showers and travertine tile floors. Bedrooms have newer carpet and paint, while crown molding accents throughout the home. Pool heater and equipment, as well as the tile roof are less than four years old. Vineyards award-wining 70,000 sq. ft. clubhouse and amenities are some of the best! Optional are the two, 18 hole golf courses, upscale, casual and pool side dining, 12 har-tru tennis courts, 3 bocce courts, pickle ball, banquet and reception facilities, health and fitness center, full service day spa, and more. Lastly, Vineyards is NOT a CDD community. Hammock Isles Vineyards Homes: Start living the life you’ve imagined in this luxury estate home just minutes from world-class shopping, dining, and Naples beaches! Featuring 4 bdrms+den/4.5 baths, this spacious Seville model shows like NEW with numerous recent upgrades. The gourmet kitchen features wood cabinetry and granite counter tops, as well as newer stainless steel appliances. All flooring throughout is new, including upgraded tile, wood floors, and carpeting. The master bedroom suite offers two walk-in closets, dual vanities, a jetted tub, and large shower. Relax and enjoy outdoor living and beautiful lake views on the extended lanai with resort-style pool and spa. Other recent improvements include exterior painting, 2 new A/C units, washer/dryer, electric hurricane shutters on lanai, and heavy-duty lanai screening. Fiber Optic integration supports High Def TV, next generation Internet, and carrier class phone services included in HOA fees. Hammock Isles is an exclusive community in the award-winning Vineyards and offers optional private membership programs for golf, tennis, fitness, and social activities. The recently opened VCC Wellness Center & Spa is great new addition. Come join our Vineyards family! Valley Oak Vineyards Homes: Elegance and Class. Located on a quiet and private cul-de-sac, this large single-story home is move in ready. Beautifully remodeled, this home offers tile throughout, updated kitchen with magnificent granite counter tops, spa like bathrooms, custom built in cabinetry, playroom/den, private office, formal living and dining room, a separate mother in law suite and so much more. With a rarely available open floor plan and cathedral ceilings this home is designed for entertaining. Open the sliders and you'll see the outdoor space is perfect for guests or a family get together. With a large private backyard this home is has plenty of room for kids and or pets to run. 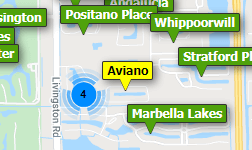 Conveniently located, Vineyards Park, shopping, dining, and Naples sandy beaches are minutes away. Vineyards Golf & Country Club offers optional, private membership programs for recreation and social enjoyment including 36 holes of golf, tennis, bocce ball, pickle ball, restaurant and a new fitness facility. Arbor Glen Vineyards Homes: H.13481 Price Reduction!! For limited time only. Inside this Wellington model at Arbor Glen in the Vineyards, with it's sprawling Courtyard floor plan complete with separate guest quarters. Almost 3,200 sq ft, this home is beautifully cared for, open and light. It's a fabulous home for entertaining, with dining and living areas opening to a second lanai with golf course view, a wet bar, and an easy transition into the kitchen complete with Butler's pantry, 42" solid wood cabinetry, new stainless appliances and Corian counters. There is a breakfast bar, breakfast room and Family room. There are 10-13' ceilings throughout, crown molding, and high end finishes. The Master Suite is truly that, with tray ceilings, his and hers walk-in closets, an enormous bathroom with double sinks, jetted spa tub and large walk-in shower. The Courtyard is enormous with an over sized pool great for daily laps. Enjoy a luxurious lifestyle, a home great for entertaining, yet feel cozy in this comfortable home. The Vineyards, known for it's beautiful landscaping offers a great lifestyle with world-class amenities. Great Naples beaches, shopping, restaurants and healthcare are all close by. Arbor Glen Vineyards Homes: H.13886 This rare contemporary designed home offers an opportunity for a buyer with an imagination to update the interior to create their own modern showcase. The floor plan, window designs and sliders that open to the lanai, lap pool and private lake view radiate a sunny, bright and airy interior. Large family room and kitchen adjacent to the spacious entry room with free standing fireplace add the modern feel. One side of the home features a large master bedroom with a unique bathroom design plus a giant den, office or media room with it’s own private bathroom. The Two bedrooms on the other side of the home have separate full bathrooms. There is lots of room in the three car garage that does not face the street. Just close your eyes and let your creative mind explode with possibilities. Valley Oak Vineyards Homes: This is the Vineyards home you've been waiting for! A gorgeous 5 BR, 2 story home that boasts over 4700 sqft of living space, w/ 3 full baths and 2 half baths, as well as an attached 2 car garage. With soaring ceilings, crown molding, tile throughout all main living areas, a generously sized loft, and ample windows throughout that give you plenty of natural lighting, this home has something everyone can admire. The kitchen has been beautifully remodeled, offering stainless steel appliances and fresh white cabinets. The bright and giant master suite is downstairs and holds plenty of space, w/ features to include tray ceilings, French door access to the pool, 2 huge walk in closets, and private ensuite complete w/ dual sinks, walk in shower, and soaking tub. The spacious patio and oversized pool deck are perfect for hosting guests, or swimming in the sunshine. This home has only had one owner and is evident by its immaculate condition, w/ a recently inspected roof that's in good shape! Valley Oak is one of the premiere neighborhoods in The Vineyards, giving you low fees, a friendly atmosphere and that quiet, small town Naples feel you are sure to love. Schedule your showing today! Need professional assistance selling your property at Vineyards Naples? Find out how an Area Specialist can help to generate more property exposure in order to get the most money for your investment in the least amount of time.